It’s the perfect season for winter sports and leisure time up in the mountains. With such extreme temperatures, it is necessary to have the right clothes in order to prevent any mishaps. In several of our previous brand collections we took a look at some of the best Danish, Finnish, Norwegian, Swedish, Italian and German brands for outdoor clothing, some of which included ski and winter sports’ attires. Today we will be going through some other great European brands, while focusing on their ski jackets, in order for you to have the best options for a safe and comfortable time on the slopes. We picked out 10 brands, which are renowned not solely for their ski jackets, but also for their other quality designs and products. Let’s get started with the first, which is a previously included brand, Helly Hansen (check it out on Amazon). A brand that was established in 1877, in Norway, Helly Hansen brings with it decades of experience on outdoor clothing design and manufacturing. Mainly focused around sailing clothing, the brand has also developed great options for those who enjoy other outdoor activities. Their ski jacket collection includes every type of jacket you need, from light ones, to the heavy insulated and fully waterproof options. Powder suits are also a great choice for those looking to have an all-in-one outfit to protect against the cold and wet. 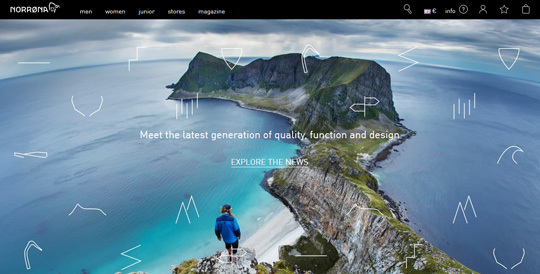 Another Norwegian brand, Norrona, has a rich history that started in 1929. 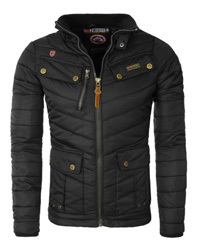 The brand designs some of the best performing jackets on the market. Being the first European brand to implement Gore-Tex in their jackets’ outer membrane set the brand apart early on, making its further design innovation outstanding. 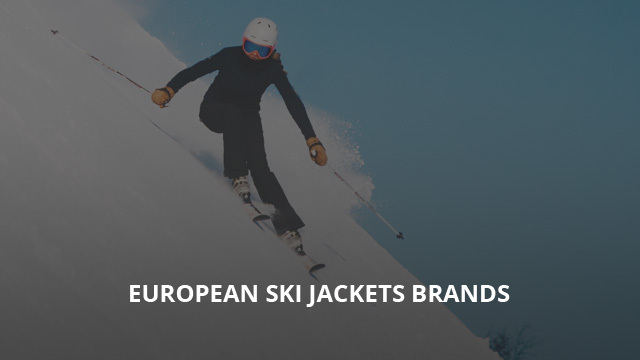 The ski jackets in the brand’s collections come with high ratings and are a favorite among Northern Europeans who want the best quality in the products they purchase. Whether you are a fan of down insulation or synthetic ones, such as PrimaLoft, there are numerous options to choose from. Breathable and fully waterproof jackets that utilize the Gore-Tex membrane for their weather-protection are also available in many different designs, styles and colors. This next brand also comes from Norway, and it’s no wonder considering that the country is located in the Scandinavian Peninsula, one of the coldest areas in the world. Kari Traa (check it out on Amazon) holds the name of its founder, Kari Traa, the Olympic Champion in Freestyle Skiing. The brand was born in 2002, after years of Kari developing and customizing her own skiwear to make them perform at their best. The ski jacket collection comes with a mix of options, ranging from typical sports jackets that are made to wear comfortably and perform flawlessly, to beautifully-cut options in elegant and feminine styles for those who want to look fashionable out on the slopes. 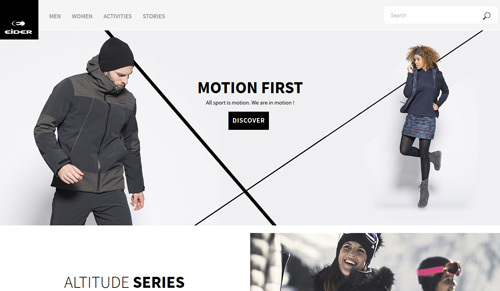 Remaining in the Scandinavian Peninsula, Sportswear of Sweden is a company founded in 1982, which manufactures functional ski and snowboard wear, which is expanded in more than 13 countries. Their Black Snow collection is targeted at skiers, providing a multitude of ski garments and gears, from base layers, ski pants and high-performance jackets. Focusing on the latter, their ski jackets come in limited designs, but their weather-resistance and performance is commendable. Options include down jackets for those who are looking to get the best insulation without having to layer extensively, as well as lighter waterproof jackets that serve as the shield against the snow. 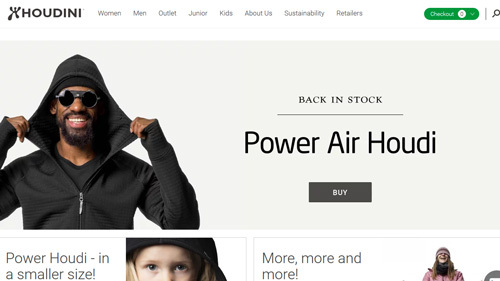 Also a Swedish brand, Houdini was founded in 1933 and designs functional outdoor clothing for a variety of activities and sports. Their clothes are designed for comfort while at the same time allowing for better performance, without hindering movement or getting in the way. Much like the majority of the brands included in this selection, Houdini, too, take great measures to reduce their environmental impact and opt for sustainability in their choice of materials and manufacturing. Despite the jacket options being limited in number, the designs are really versatile and allow for a multitude of wearing purposes. 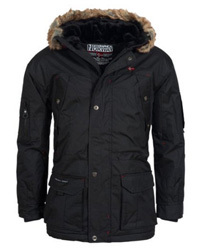 Windproof and waterproof jackets, as well as heavy insulated parkas are part of the brand’s jacket selection. It’s time to move a bit to the south, where we will look at Eider (check it out on Amazon), a French brand established in 1962. In the nearly 60-year history of the brand, its designs have evolved from those focused mainly at mountaineering and ice climbing, to other outdoor activities. Still, their best-performing products are those made for mountain wear, with options for both mild and cold weather. 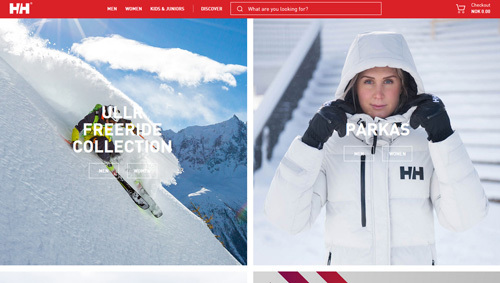 A collection of ski jackets and other ski wear can be found on the brand’s website, which includes options for both men and women. Whether you are looking for a warm and light fleece jacket, or a specialized waterproof shell, with or without a hood, all of these options are available. A German brand, with a history that starts in 1932, Bogner (check it out on Amazon) was established by the champion skier Willy Bogner Sr., who was later joined by his wife Maria Lux, which is credited as the designer who developed and introduced the stretch pants to the ski fashion industry. The brand is currently run by Willy Bogner Jr., who also went into skiing and later into the movie and fashion industry. 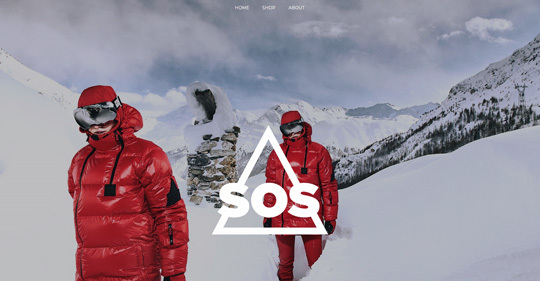 The brand holds the belief that “A skier is only as good as the kit”, thus showcasing the brand’s dedication to designing and manufacturing high quality ski clothes and accessories for all ages. 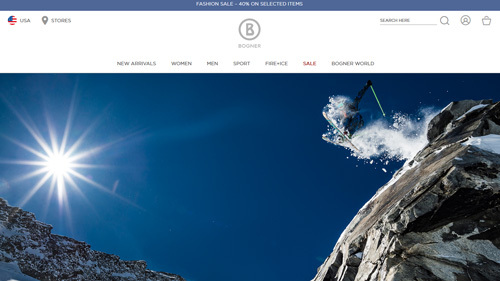 Combine that with the founders’ and their son’s first-hand experience with what a professional skier requires, it’s not wonder that Bogner holds such a prestigious position among other sportswear brands. Ski jackets and parkas insulated with down are the staple of the brand’s products, but lighter and more performance-focused designs are, of course, available. We are still in Germany, with a brand that is frequently part of our selections, Jack Wolfskin (check it out on Amazon), which was founded in 1981. 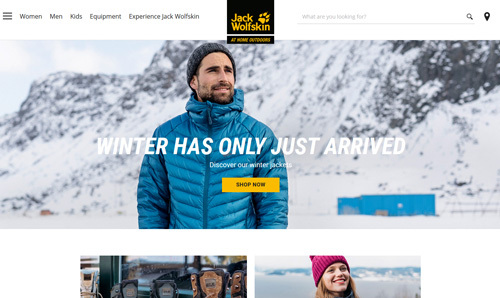 With a product range that covers almost all outdoor activities, for any season, Jack Wolfskin has managed to establish itself as a major brand among other sportswear companies. Their products are very well made and the price tag reflects the brand’s efforts and craftsmanship. The ski jackets come in options for both men and women, as well as in different designs, from light waterproof shells, to insulated padded jackets that provide better protection against the cold. 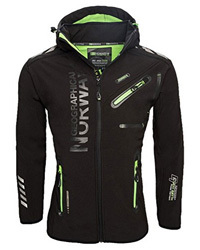 Depending on what it is that you exactly require, odds are you will find it within their ski jacket selection. Moving on to an Austrian brand, Frauenschuh started out as a leather manufacturing company in 1950. It was in 1974 that the brand opened its first fashion shop and from then it would go on to design and manufacture quality winter wear for a variety of activities and lifestyles. Designs that are suitable to wear out on hikes, on the slopes or as part of your daily wardrobe can be found in the brand’s collections. 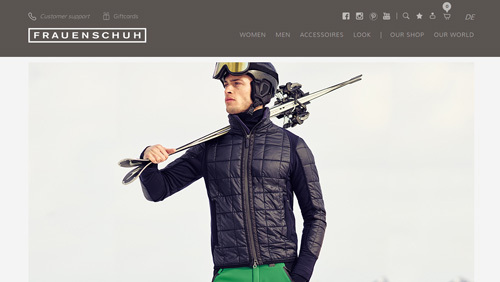 Their jacket designs are quite versatile and can be worn for many winter activities, including skiing. Light fleece jackets that are great for layering, as well as more durable and weather-resistant ones are all part of their designs, with options for both men and women. The last brand in this selection is the French manufacturer of alpine wear and equipment, Skis Rossignol (check it out on Amazon). Founded in 1907, the brand has over a century’s worth of experience and reputation when it comes to winter wear for activities up in the mountains. Their products come with options for men, women and juniors and are organized accordingly depending on the activity you are looking for. 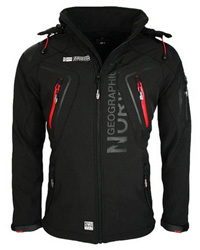 Ski jackets are numerous and designs that range from the lightest to very high-performance are available. 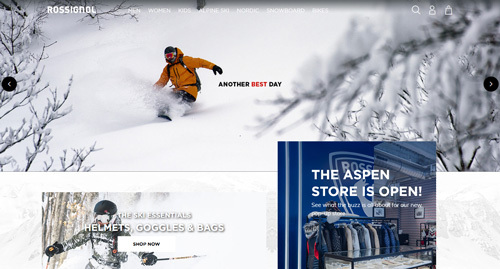 While our focus is on ski jackets in this selection, Skis Rossignol is an all-around ski brand, serving as a one-stop shopping place for those looking to spend some days skiing or snowboarding.